Believe it or not, Christmas is just a few short weeks away! 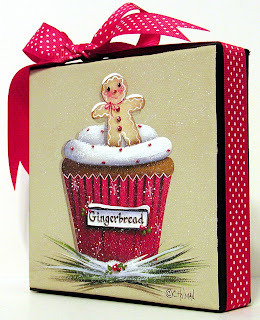 Yesterday I finished this little cupcake painting and put it up for auction on eBay. One down and several more to go!! 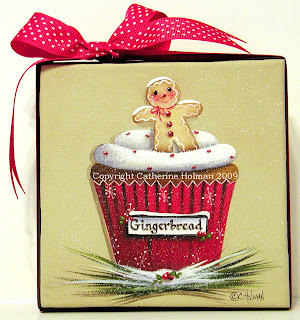 A warm little gingerbread, hot from the oven, is tucked into the snow like frosting in this Christmas cupcake. A red liner is decorated with white snowflakes and a little tag stating the flavor. Tiny red sprinkles adorn the fluffy frosting and evergreen is tucked in at the base of the cupcake. Snow falls gently giving this cupcake a very wintery feeling. A red and white polka dot grosgrain ribbon is wrapped around the edges of the canvas and is tied in a bow at the top. Oh that is adorable! And it looks wonderful sitting on that vintage red roller skate!! This is an adorable painting Cathy! You're getting me excited for Christmas! I have my log cabin painting from you (that I bid on last year) - hanging in the living room of our log home - perfect for the christmas season! 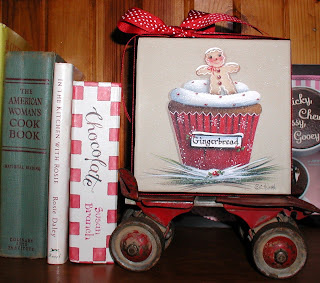 What a sweet painting.. looks good enough to eat.... lol I just love your paints.. they look so very real..
Oh the gingerbread- Cupcake painting is too sweet. Hi nice to meet you! your art is so fantastic, congrats....I love cupcake too, I´m paint cupcake all day. For my tv show and my customs. Cathie, that cupcake is just so cute! I'm glad you are posting more! I missed you. Hi Catherine! What a sweet looking gingerbread man! We're feeling the Christmas Spirit around here, too! P.S. You look great gray! Oh Cathie! It's deliciously delightful and it's making me hungry! PS- Stop by I'm having a giveaway! That's as cute as it gets. Your work is beautiful. You are a very talented lady and you inspire me. Truly a cupcake that encompasses the holiday! Makes me want to bake ... and eat, actually! :) As always, your artsy gifts are such a joy!